Room allocated was on the top floor (almost attic room) which meant having to negotiate the well documented steep steps. A challenge! The hotel room was extremely small and the beds were very narrow and not at all comfortable. The heating in the room was always on and impossible to turn down.Breakfast was very basic and coffee was only available in sachets. No fresh rolls only bread supplied. Orange juice was ok. Staff were friendly enough however I think even the basic price we paid was a bit much. Ensure you keep your receipt for the 20 euros deposit for tv remote. 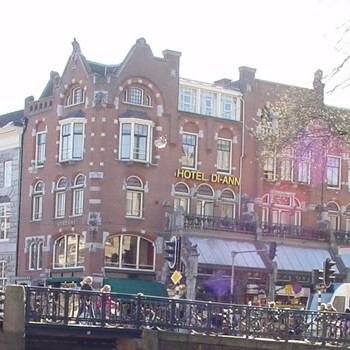 The hotellocation is good with easy access to Dam Square and tram lines. Road is busy and can be noisey at night. Overall I would not stay at this hotel again. Oh and Sarah's Pancake store is much better for breakfast than having it at hotel. Located 1 minute from hotel. A clean hotel. very happy and helpful staff. Breakfast basic,eggs, toast, cereal etc. but those terrible steep staircases. The hotel was on the third floor of a large building and as we were on the fifth floor there were an amazing amount of stairs to climb each time we returned to our room. The room was small and in the attic of the building. There was an adequate bathroom and plenty of clean towels. We would not return here simply because of the mountain of stairs. A normal sized hotel room that had been converted into two meant that it was the smallest bedroom we have ever stayed in (and they are all the same size), it could also do with some smartening up too. However it was clean and situated in a good position, two minutes from Ann Franks house. The breakfast was self service, toast, corn flakes, hard boiled eggs, coffee and orange juice, as much of it as you wanted. Probably overpriced for what is on offer! Clean hotel, maid service daily, fresh towels and beds made. Basic breakfast (just toast), ran out of cutlery/crockery often, had to wait for it to be washed. 5 mins from Dam Sq, 15 mins from red light district/Leidspein. On a busy street with shops/restaurants, over looking canal. Busy road with trams, quite noisy but ok when doors shut!! Small room but had 3 beds, balcony and nice views. Great shower. Friendly staff, helpful on directions etc. Basic hotel friendly staff very, very small rooms. Noisey situation- on main road trams etc, Very boring breakfast and basic. Extremely steep staircase for access 2 fit adults struggled with luggage. We were informed Visa machine had broken and they wanted cash surprisingly, it worked after we insisited there was no cash forthcoming.